So after the optimism of my previous post hoping that I would make it the 9miles to Perranporth, well I did, only it was 3days later than planned. It turned out that I wasn’t better and needed to rest, so that I did. In 48hrs I managed to crawl out of my tent to check out an ‘Alternative Skills Fair’ at an Ecologic Park next to the campsite (where I learnt about a Cornish Apple Project) and to the local beach at Porthtowan plus the cafe for some toast when I was getting my appetite back. It was Monday when I got on my way to Perranporth. Set off just after the rain had stopped and the only thing I fancied eating were Tangfastics so that’s what I ate! 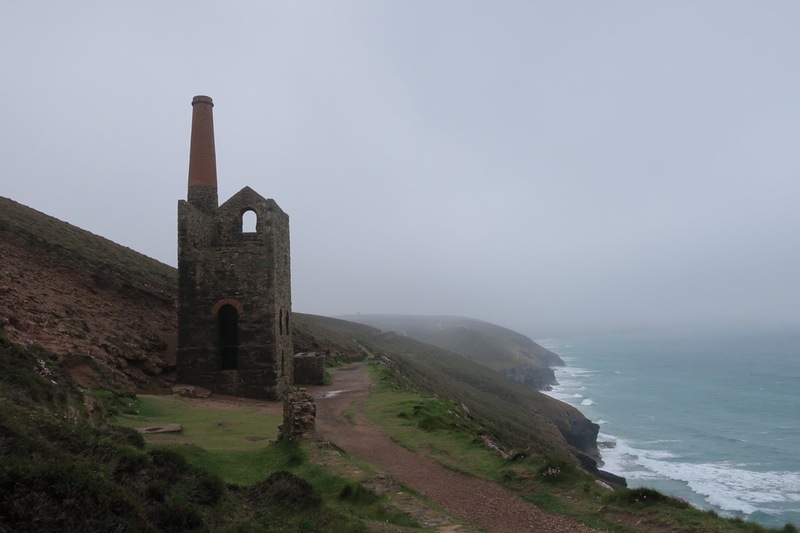 Got to St Agnes in good time passing one of the many mine shafts that scatter the coastline around here. Very atmospheric and evocative given my current reading material of Poldark – highly recommended, and that’s coming from someone who doesn’t like period fiction/drama. The pub in St Agnes would’ve been awesome if I had felt better, lots of fresh seafood and attached to a brewery, what more can you ask for? Ah well, there’ll be others. Instead, I forced down some lemonade and a few chips and went on my way. 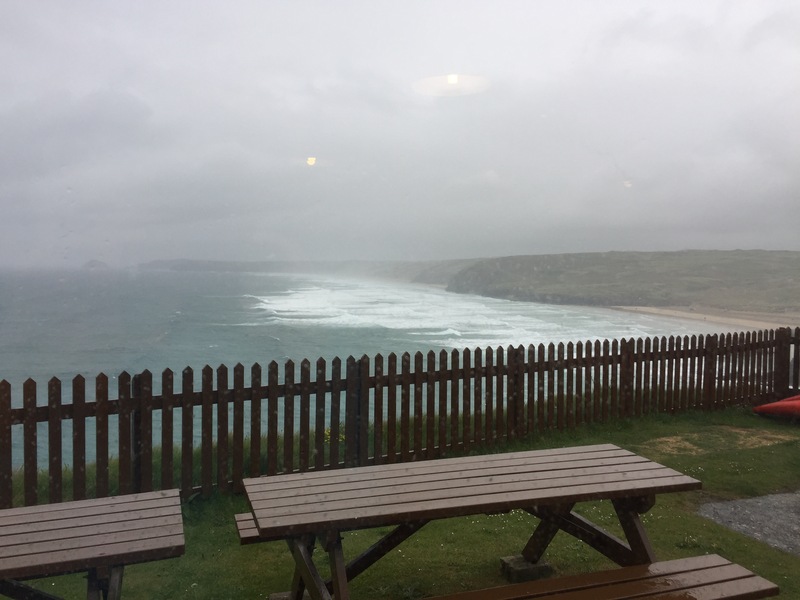 Got to Perranporth YHA in the increasingly heavy rain but it wouldn’t open for check-in for a couple of hours so I went and explored Perranporth and one of its pubs. Once I finally got in I immediately fell in love with the hostel. It’s very small but perfectly formed and the format works so well. It’s capacity is about 20ish and it feels very much like a home from home with stunning views to boot (when the cloud lifts!). Those 9miles took it out of me as I still wasn’t able to fuel myself properly and since the weather forecast was looking poor, I took another day off…! I know I know, if I keep going at this rate I’ll never get to John O’Groats, but I don’t plan on getting gastroenteritis more than once! Rather than slob about in the hostel all day feeling frustrated and lazy, I took a bus over to the county town of Truro and visited the museum and cathedral. In the rain on a midweek lunchtime it wasn’t all that, but I could see that the cobbled streets would be very charming on a busy sunny summer day. The warmth of the hostel and the other people staying there did the trick and when Wenseday came I finally wanted to eat something, so after a cereal bar off I went; ‘On the road again, I just can’t wait to get on the road again…’. The route began by crossing Perran Sands in the rain and over the dunes towards Holywell. On the beach I met a guy walking the entire SWCP who told me he had just met a couple who were walking LEJOG but that was an hour ago so they were now 2hours ahead. At my pace I wasn’t going to catch them up, ah well, so near and so far from meeting someone else doing what I was doing, perhaps there will be others? Perhaps a tad unfair, although this was one of my first encounters as I entered from the west. It was the largest town I’d been though thus far and it was a bit of a shock to the system. The streets seemed packed and there was so much hubbub, it put me in a spin, so I just motored through as fast as I could. This brought me to Watergate Bay, which was an unexpected find, it was absolutely stunning. From the top it appears to be a standard cliff top, but get down on to the beach and there is evidence that the high tide surges right up to the base of the cliffs and cuts away at the rock leaving caves at the bottom of this huge and dramatic cliff face. Standing at the bottom and looking up I felt so tiny and insignificant, it was just awesome. Plus there are streaks of purple running through the rock…I’ve never seen purple rock before. 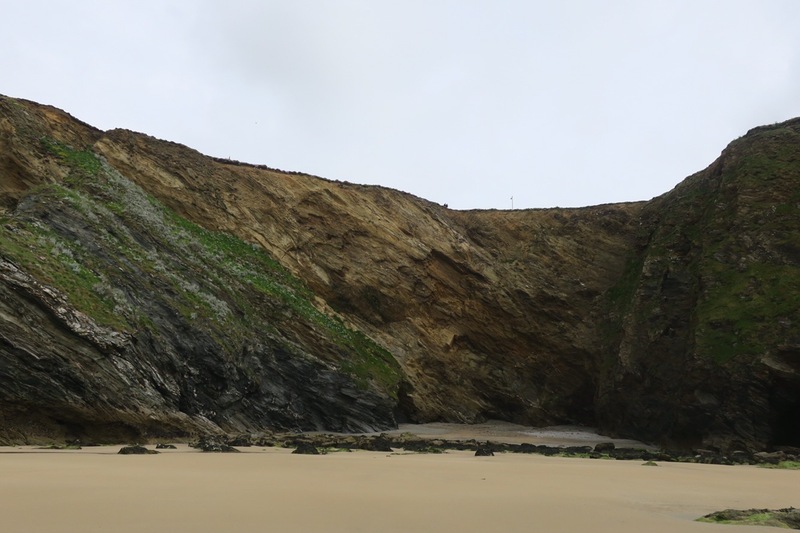 From here it was just a couple of miles on to Mawgan Porth and my campsite for the night; Magic Cove. When I arrived the owners were out but I had couples coming over to help, almost tripping over themselves to offer me tea, coffee or anything else I might need/want – wow today has been all about generosity and has given me a nice warm glow inside! Well that and the first beer I’ve had in days! 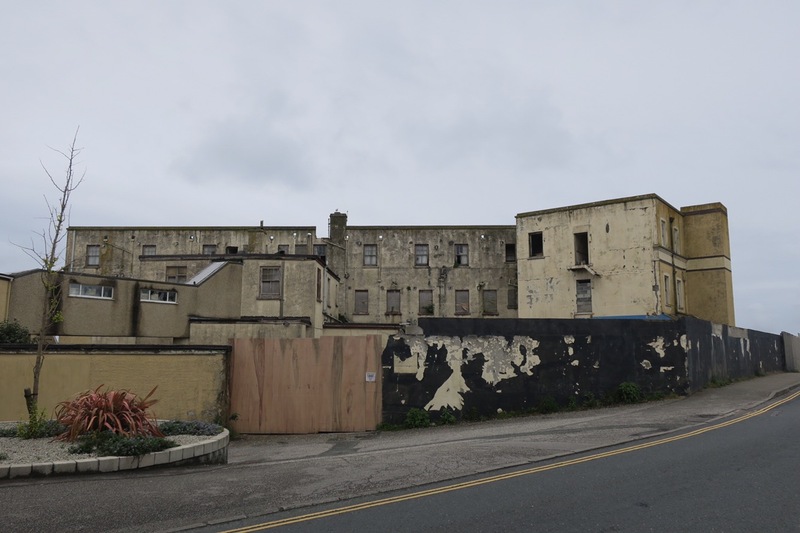 If you want to read atmospheric books about Cornwall I would suggest Daphne Du Maurier -Jamaica Inn or Frenchman’s Creek. Wrong side of Cornwall but great reading nevertheless. Aw thanks Jane. Yes, that was going to be my next one. I think I’ll read Jamaica Inn and then on into Devon I’m going to read Cider with Rosie. Do keep the geographic literary suggestions coming! I’ve got a list I can add them to. Good luck with your sojourn Lucy. I just noticed you were about to make your way past where I used to live in North Cornwall. If you get the chance, consider taking a rest stop at Widemouth Bay (just South of Bude). 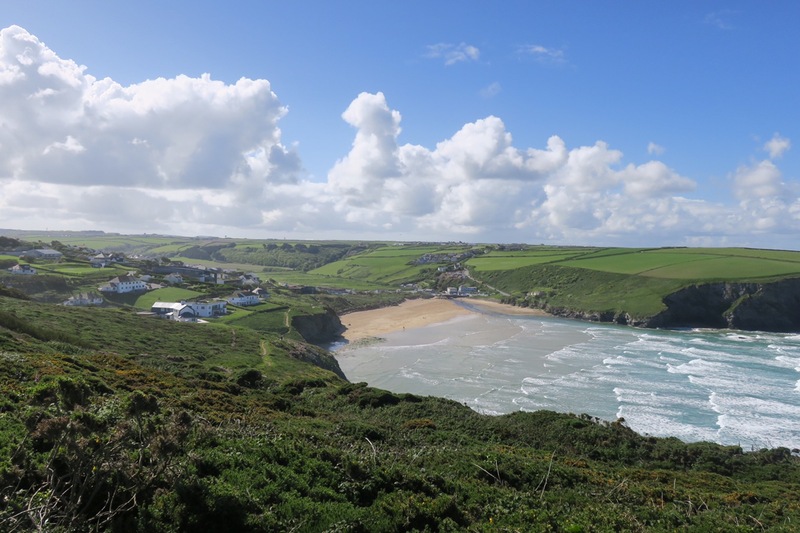 It’s marked on maps as Widemouth Sands and is accessed from the A39 turn-off at ‘Box’s Shop’, where the narrow coastal road will take you to the main beach car park. It’s a great spot to stop off and spend an hour or two to experience some of the magic of the North Cornwall coast. Take a look at the spectacular geology there which few people know about. Enjoy. Wishing you well. Take care. Alan (Kingston Bagpuize agency posse).